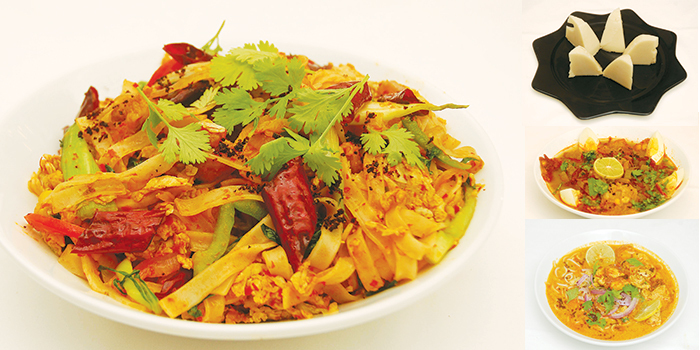 Chef Baker reasons that a�?aside from popular dishes like mohinga, not many people are used to Burmese food. Our buffet will have anywhere between 15-20 Burmese dishes and this way you can taste more of the cuisine.a�? And after sampling a bowl of the filling mohinga, we must agree that tasting portions would be ideal for someone wanting to explore. If youa��re curious, the version served here is a broth of fish paste with a dash of coconut milk and plenty of boiled banana stem. And just like in the khao swe, you will find traces of crispy fritters that help break the monotony of the noodles. Other ingredients that make appearances throughout the meal are golden fried onions and garlic that, when sprinkled on to a dish with a squeeze of lime, help balance dominating flavours like coconut or fish paste. a�?The Burmese use fresh or dried red chillies like we do. Only they roast the chillies in oil before powdering them,a�? chef Baker points out. And how can she be sure? Najma Mubarak, a consultant in the cuisine who lived in Burma till she was 10, has recreated her mothers recipes for the festival. Expect hearty home style preparations of prawn sebian (jumbo prawns in a tomato and chilli based gravy), spiced rice and pigeon peas and minced chicken noodles (spicy, flat rice noodles tossed with egg and minced chicken). And even humble fare like the egg cha wu (boiled eggs garnished with a zesty smear of onions, chilli and lime) or kownimo (a portion of sticky rice with diced fruits and coconut milk) that we end our meal with. Buffet at Rs1,350 plus taxes.